Decorating your home or apartment doesn’t have to be expensive. With some research and an innovative design plan, you can create a look that is really special. If you are working with a small budget, it is smart to be simple and take things step by step. This gives you the ability to make some beautiful changes, while holding off on other projects until you have enough money saved up. With a little creativity and personality, you can do something really unique. With just some paint or upholstery work, your home can have an expensive look for almost nothing. Before you begin your decorating process, it is smart to do some research. By knowing what it is you want before you begin, you can save yourself some money. Since hiring a professional decorator probably isn’t an option, you will want to figure out your own design personality, and what would look best in your size space. Pick up decorating and design magazines for ideas. You can also do some research on the internet to find decorating ideas and tips, and learn the rules to having the perfect design aesthetic. The easiest and most affordable way to change the look of your place is with paint. Today you can find paint in a huge range of colors. This is where you can have fun and be really creative. The color you decide to paint your walls can set the tone for the rest of your decorating. Once you have made a decision, you can begin to color coordinate other inexpensive items like black mirrors, throw pillows, rugs, and accessories. Consider incorporating prints that tie-in with your new wall color. 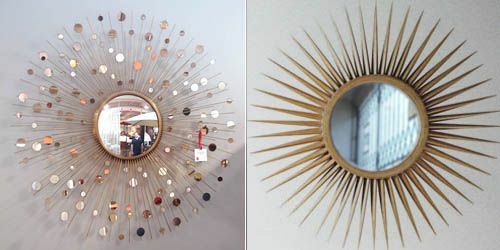 Curtains, artwork, wall mirrors and other knick-knacks can also be affordable extras that add some fun to your space. If you want to purchase some bigger items like furniture, check out yard sales and thrift stores. These places are great for finding pieces that are extremely affordable. Even items that are in bad condition can be refurbished into something spectacular. You should also consider revamping the furniture you have now. A couch or chair can look new with some fun upholstery. You can even paint an old nightstand or dining room table and make them look like you bought brand new pieces. Don’t think that you have to spend a lot of money on furniture. This can be one of the easiest ways to be creative and make something old, new. As you begin the process of redecorating your home or apartment, do some research and be creative. Take your time and figure out what it is you really like and how you can do it on a budget. There is no end in sight for creative and crafty ways to make your place look spectacular. With a little work, you can easily achieve an expensive look without having to spend the money. Have the home you have always dreamed of in an affordable way. Find out more about Home Improvement Blogs.